Having a crafter in your life can be a great thing, along with all the pretty things they make they’re also great for fixing buttons or darning sock and just generally lending their skills to all sorts. However if it’s not your personal field of interest, trying to purchase crafty gifts for them can be difficult when you dont know the difference between a mellor and a stiletto, and you though that goldwork would be something a jeweller does not an embroiderer. 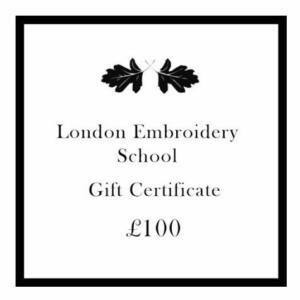 In this case, we have the new Gift Certificates section of our website to make it easier to purchase this kind of gift for them without having to make the tough decisions (to tambour, or not to tambour…). With the choice of £10, £25, £50, £100 and £150 certificates, you can select how much you would like to spend. Once you have made your purchase you will be redirected to the confirmation page with your downloadable pdf highlighted in purple so you can print it out and add the personal details to present to the lucky recipient. The recipient can then use their unique code at the checkout for the item of class they would like to put it towards. Simple! This is now an automated process so should you wish to purchase one whilst we are closed for the Christmas Break, you will still be able to complete your purchase and have access to your certificate.